Alanis McLachlan has not seen her mother in 20 years so when she is summoned to Berdache, Arizona to collect her inheritance she is very surprised. 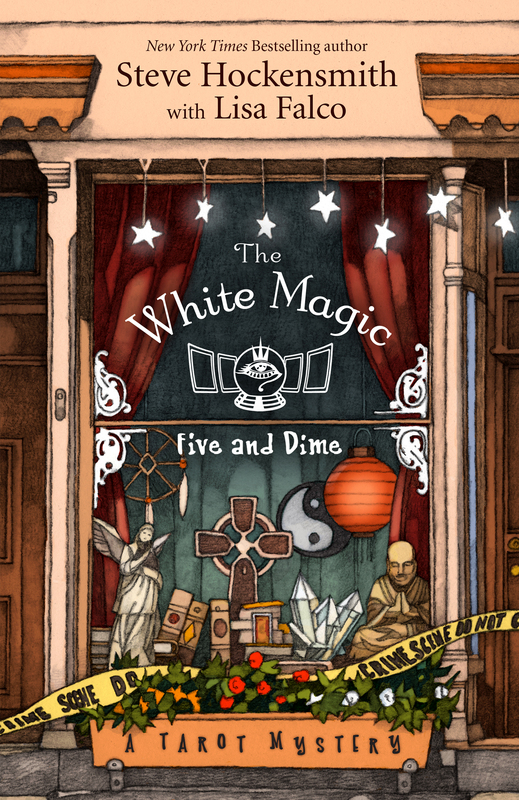 Her con-woman mother has left her The White Magic Five & Dime, a small shop where her mother has her tarot card reading business. Unsure what to do with the place she decides to temporarily open the store to try to figure out how and why her mother died. She assumes one of her mother’s cons was run on the wrong person and she ended up paying for it with her life. Alanis McLachlan (the name she is currently using) has quite a life which makes her a very interesting protagonist. Her mother has been a con-woman Alantis’ whole life and as soon as she was old enough she ran away and left that world and her mother behind. Arriving in Arizona with a long list of unanswered questions she finds her mother had a teenage roommate. Did her mother replace her with this girl to help her with her con games? She hopes by reopening the shop and meeting with her mother’s customers she may get some answers to her questions and find out who killed her mother. Alanis is very cynical but with her upbringing it is easy to understand why. She truly is a good person and wants to do right for a mom who really did a lot of things wrong. I was engaged by her story immediately. The authors also gave us some great supporting characters. Clarice, who seems to be Alanis’ mother’s apprentice, and Josh Logan, the officer in charge of her mother’s investigation. The dialogue between Josh and Alanis is absolutely fantastic. The mystery was well written and well plotted. All the information about Tarot Cards was very interesting. While this area of Arizona is know for psychics and its energy vortex the paranormal part of the story is very mild. Alanis starts out feeling it is just another of her mother’s con’s but the story has a nice twist that makes her question her theory. I can’t believe how quickly I read this story. I was captivated from beginning to end!! I can’t wait for Book 2. I have this on my t-b-r list at the library. It really sounded interesting and you make it more so. Thanks. Sounds like a fun read. I have it on my TBR. Glad you enjoyed it!